Cute pincushions are always a fun gift for crafty friends, or a fun prize for a craft blog giveaway! That's right, you can win one of these adorable pincushions along with a collection of coordinated scraps! All 3 pincushions will be given away! All the details are at the bottom of this post. First, let me tell you about the pincushions. I fill my pincushions with crushed walnut shell litter (it's used for birds and lizards). You can buy an enormous bag of this stuff at the pet store for about $10. This bag will last you forever, or, at least, a very long time. I bought my bag of walnut litter about 10 years ago and I’ve probably used half of it. My guess is I’ve made at least 20 pincushions with that. The first pincushion is made from a 4-patch quilt block. It's tufted with a vintage button. Pincushion #2 is basically a miniature pillow with beaded embellishments. The pincushion below is called a “biscornu.” Biscornu is a fancy-pants French word meaning “crooked” or “bent.” It’s made from squares, but instead of lining the squares up, you match the corners of the squares to the center points of the sewing lines. Making biscornus is popular in the cross-stitching world, but there’s no reason you can’t do it with fabric. Another option is to use a 4 or 5 inch orphan block as one or both sides. Step 1: Cut two squares of the size you want plus .5 inch for seam allowances. I cut mine 4 inches square. Step 3: With right sides together, match one corner of the top square with the center point of the sewing line on the bottom square. 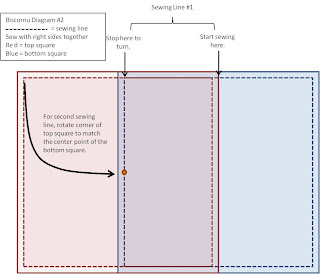 With your needle threaded, come up from the center point of the bottom square. Don’t pull your thread all the way through just yet. 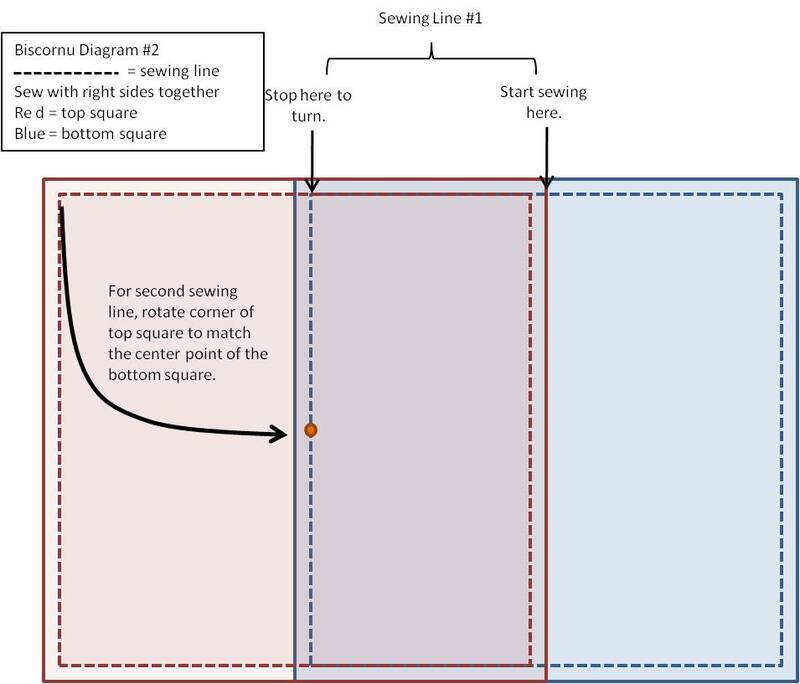 With the needle still in the fabric, twist your top square 45° clockwise and match the center point of the top square’s sewing line to the corner of the bottom square’s corner (see Diagram #1). Pin, if you want. Step 4: Using a running stitch, sew from your starting point to the first turn. This is the first of the biscornu’s eight sides. Keep your stitches fairly close together, take a backstitch after each 4-5 stitches, and take a back stitch at the corner. Step 5: You are going to make your first turn. Turn the entire piece 45° clockwise so the seam you just sewed is now to your right. 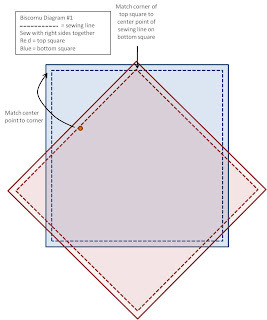 Twist the top square 45° counter-clockwise and match the corner on the top square to the center point of the sewing line on the bottom square (see Diagram #2). Sew the seam as you did in Step 4. 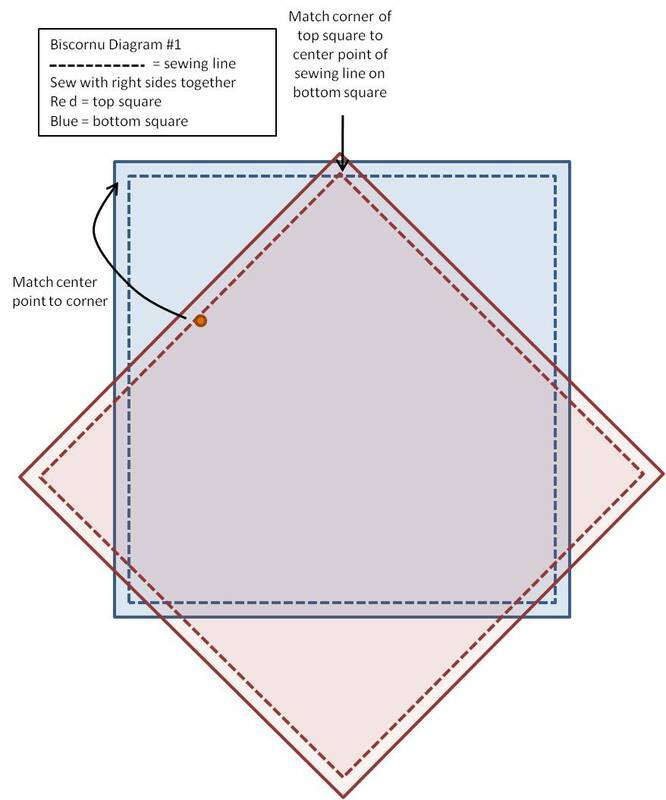 Continue in this manner of twisting the top square to line up with the next point on the bottom square, then sewing your seam until you only have one side left to sew. Turn your work inside out. Step 6: Time to stuff your biscornu. I use a really small spoon to scoop the walnut litter into the opening on the pin cushion. Fill it as much as you can, but leave a little wiggle room (since it will be tufted, it will be solidly filled). Turn your final seam to the inside and sew the pincushion closed using a blind stitch. Step 7: We’re going to tuft the pincushion in order to pack the filling tightly together. It will also make the points pop better so you can see the unique shape of the biscornu. You want to use a strong thread doubled to do this. Starting at the top of your pincushion, stick the needle into the center mark you made in Step 2, and pull it out through the center mark of the bottom, then go back up. Do this at least twice, pull your thread as tight as you can. With your needle back at the top, take two small stitches in the top fabric as close to the center mark as you can. These two stitches will lock your tuft so it doesn’t work loose. Now, take your buttons and sew securely them over the tuft. I sew on both buttons at the same time (when I go down through one button hole on the front, then come out through another hole on the other side). When the button is sewn, take a couple of securing stitches underneath one of the buttons, tie a knot, then stick your needle into the pincushion and pull it out about an inch away (that will hide the thread) and snip it off. Step 8: (Optional). I like to sew on a trim around the seam. I like the way it looks and it will cover up any stitching that is visible. Now, about this giveaway! Three lucky readers will win one pincushion and one set of coordinated scraps from which they can make their own pincushions, or other scrapbuster project. Scraps may include fabric, yarn, trims, beads, buttons, etc. Everything will come from my personal stash so I promise it is good stuff and the scraps are a generous size. You will receive as much as I can stuff in the box! Sample scrap pile that you could win! Vote on the latest challenge (Anthropologie-Inspired Balloon, or Iliana I-cord Headband). 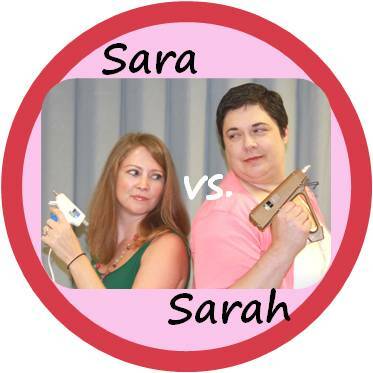 You must be a follower of Sara vs. Sarah to win. That's it! Piece of cake, right? You can enter up until voting closes at 11:59 pm PST on Tuesday, March 8, 2011. Winner will be determined by random.org and announced on Thursday, March 10th. I will contact the winners via email and they will have 48 hours within which to respond and claim their prize. If prize isn't claimed in that time, a new winner will be chosen. Open to residents of the US and Canada only. So vote and leave your comment now! The pincusions are so cute! I follow, and I voted! (love hot air balloons that is all I am saying) and thanks for the giveaway! I voted. You Sara/hs are such busy-bodies! And I mean that in the best way. OK, I voted. And I'm a sucker for pincushions and have a bag of "walnut litter" in the basement so I'm ready to go! Oh, and yep, I'm a follower (you guys are great!). Hi! I just love your guys projects! I voted and I hope following on facebook is ok. Never thought to use walnut shells for pincushions before. I will have to look into it. P.S. 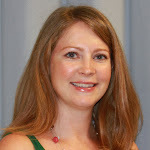 I am another Sarah! LOL! You can never have to many pincushions and these little beauties are great. Thanks for the tutorial on how to make one. I'm a follower and I voted for the headband. I follow and I voted. I had been contemplating a non-cross-stitched biscornu and am glad to see that someone else thinks like I do! 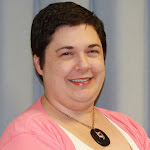 Cute Sarah, they photographed great didn't they! I voted and want to throw my name in the ring for a pin cushion! They are SO cute! Love ALL of your crafts! You two are amazing! Love all three pincushions - pincushions are my weakness!! I am a follower and just voted. Thanks for the great giveaway. I am one of those people who thinks I can do it myself, I can figure this out, I can make my own. Sometimes it works; sometimes it doesn’t, but it’s usually a good time! Have an Idea for a Challenge or Tutorial? Drop us a line or leave a comment. We'd love to hear it. I've been crafting since childhood and will continue crafting until my eyes, hands, or mind give out. The secret to my success? Only show them the stuff that turns out! Please let us know you were here by leaving a comment or following us.